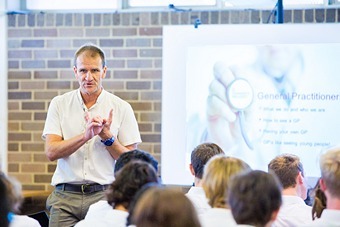 The uConnectHealth program is coordinated by Sydney North Health Network (SNHN) and delivered by GPs and nurse facilitators to year 10 and 11 students in schools within Sydney’s north. The program, formerly known as GPs in schools, was developed from evidence based research and helps to build confidence and health literacy in areas such as access to healthcare, medical appointments, specific youth health issues, confidentiality, Medicare, and their healthcare rights. uConnectHealth empowers students to anonymously ask questions that matter to them in a safe environment of approximately 15 students to one GP/nurse. Since the program began in 2002, approximately 50 GP and nurse facilitators have run workshops in 19 Sydney north schools.